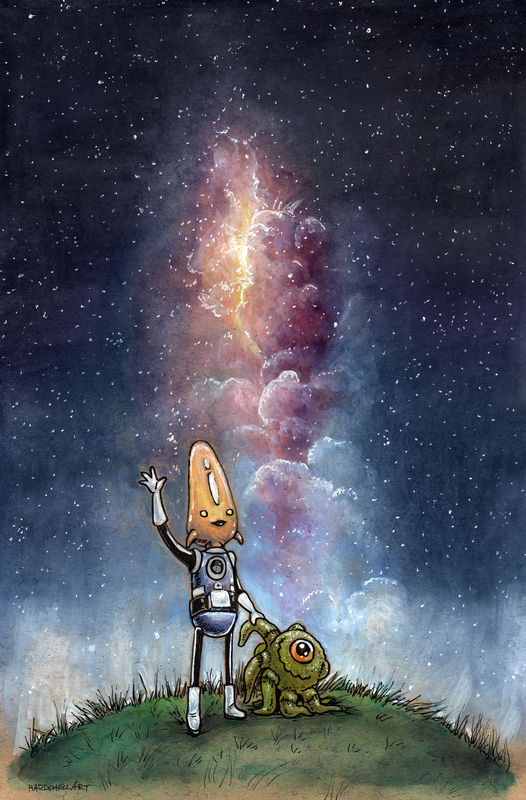 Today’s Albert the Alien “summer break” is another submission from Ashley McLaughlin – and it is absolutely stellar! And she’s not wrong. I think 7th grade is around that time where some kids (maybe late bloomers, maybe those of us just a little more in touch with our younger side) really start to move away from our childhood pieces like a stuffed animal. But some of us (cough cough…it might be me) still find comfort in those childish items. I still have my stuffed animals from when I was a kid. Granted, they’re in my parent’s closet and I haven’t slept with them in my bed in years. But whenever I go home and open that closet, I do find myself pulling them out and giving them a big hug. I find comfort in that. And hopefully, there are other people out there who do the same thing. My next convention appearance is going to be Wizard World Chicago, here in Rosemont, Il. Gabo and I will both be in attendance, and we’ll have the new Reading with Pictures volume 2: Comics That Make Kids Smarter! There’s a brand new Albert the Alien story in that book, so you should definitely pick it up!